Words cannot express how excited I am to finally be sharing my little girls room with you guys today! Wooo hooo! It was a dream for so long, then a plan, then it began to come together, but it took forever. Now I am happy to say that it is not only completely finished, but Miss Nora is all moved in and the nursery is ready for baby boy! 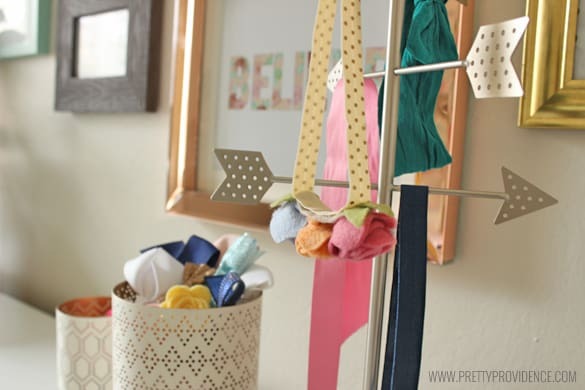 I can’t go any further without giving complete design credit to the crazy talented Kelsey from The Wells collection for Nora’s precious room! Also I need to give some props to my hot hubby for assembling the bed, dresser, lights and hanging the wallpaper (pregnancy perks, guys). So, in the past I have always decorated my home (and all the rooms in it) piece by piece, little by little, which is probably typical for most people, right? 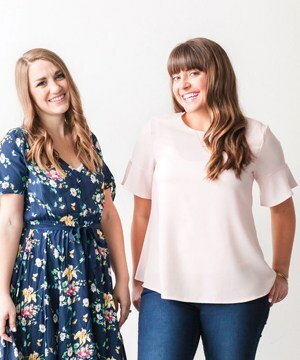 This time was different because instead of spending money a little at a time for months, I decided to reverse the process and save up for months and then buy everything at once… and it was so fun. It was super hard being patient and leaving the money alone while I was waiting, but it was actually really fun and easy to be able to do things all at once, and see the real progress being made! It was also the first time I’ve ever been able to work with a designer, which was incredible! She is the best of the best, and was able to take the vibe I wanted and make it way cooler than I could have ever envisioned! 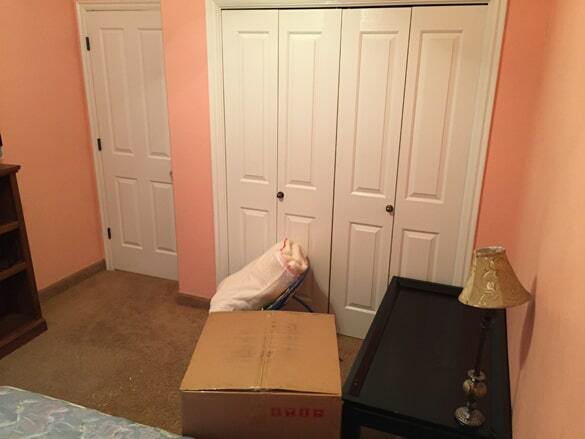 Here are a couple before pictures… so you can see for yourself what we were working with. The space is so, so small. It’s amazing how bright and cheerful it feels now when it used to look like this: Crazy transformation, am I right??! Read on for all the details, links and about a million more pictures! Okay let’s take a little breather and run through all the links, shall we? 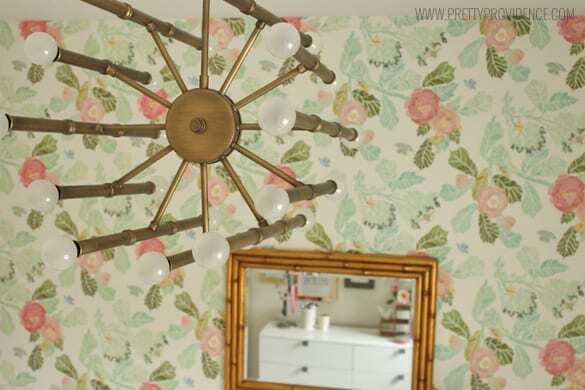 Wallpaper – As you all know, I am a pretty frugal girl, and this wallpaper was the major major splurge for this space. It helped that we got deals on literally everything else, and I had some Christmas gift cards hoarded. We looked at other options for hours but ultimately just couldn’t find anything that tied the space together nearly as well! So we opted for a focal wall rather than the whole room to save big $$$, and it definitely helps make the space. 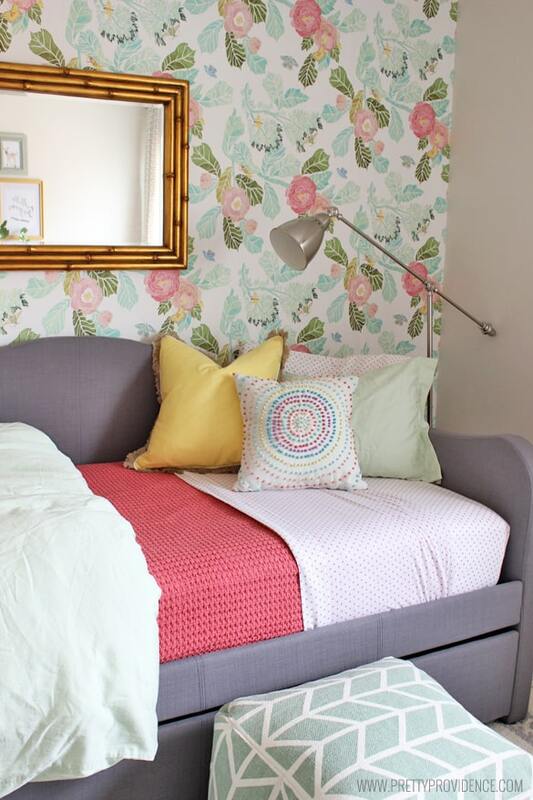 Daybed – Because of the small space I knew I wanted a daybed and because Nora will eventually be sharing this room I wanted it to be a trundle. If you are looking for the same things RUN DON’T WALK to buy this bed. Seriously screamin’ deal. Oh and that grey linen upholstery?! I’m in love! 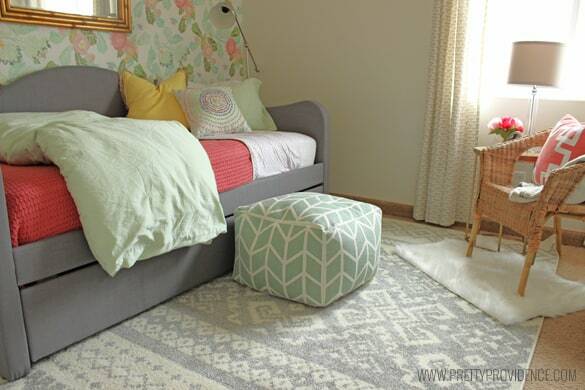 Moroccan Rug – Just love. Amazing price, really nice quality. Dresser (via Amazon) – This is the one piece in the room that we bought that I haven’t been 100% happy with. I completely love the look of the dresser, but it is really cheaply made. 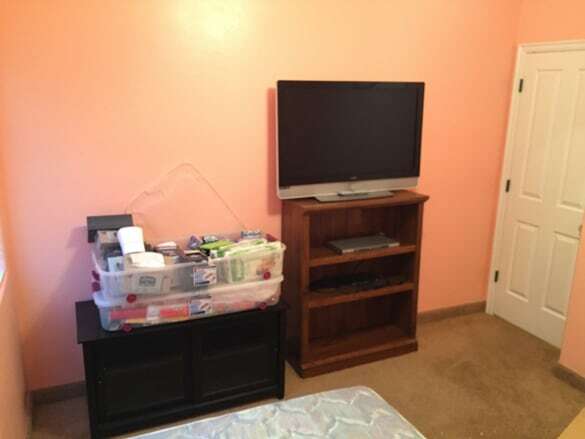 Kelsey found basically all the major components of the room on various deal sites or sales, which allowed us to stick closely to our budget, but you also don’t get to see anything before it’s shipped and you set it up. I guess what I’m saying is, sometimes you get what you pay for, and this dresser was super cheap, haha. It still works and I love the look of it in the room, but I can tell you now it won’t last longer than a few years. Woven Chair – Heaven bless IKEA. $34.99 for this chair? I just want to marry that place. 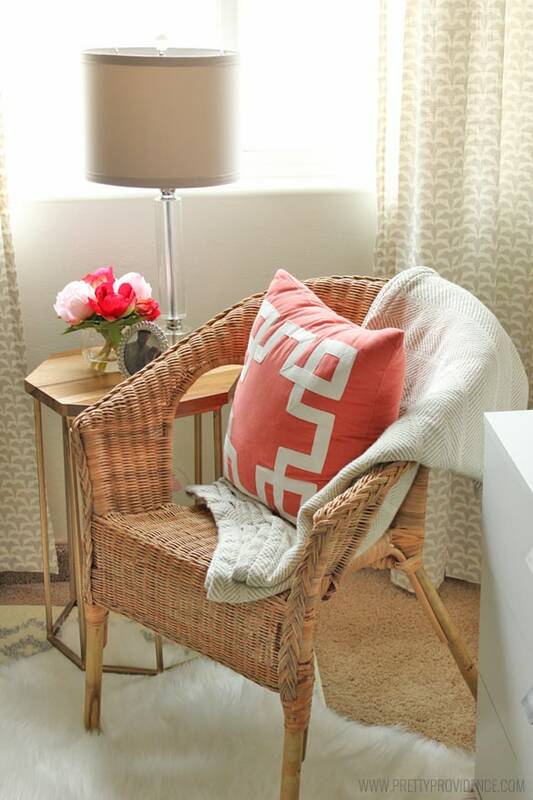 Metal Accent Table – You gotta love Target too, I mean, is it just me or have they seriously upped their home decor game in recent years? Chandelier – Another piece that takes the room to the next level! It’s gorgeous and so so bright. Highly recommend. 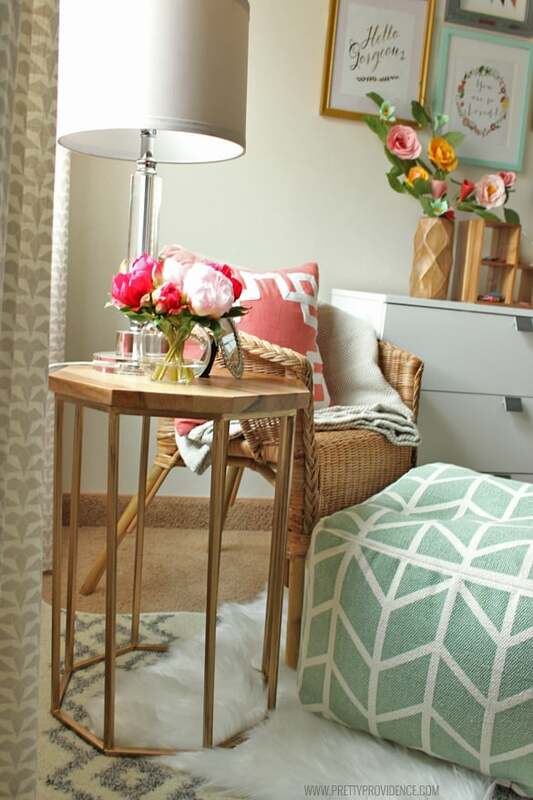 Ikea Floor Lamp (if you don’t live by an IKEA, here it is via Amazon) – Love what Kelsey did in the room with the contrasting metals and textures. She’s a genius. 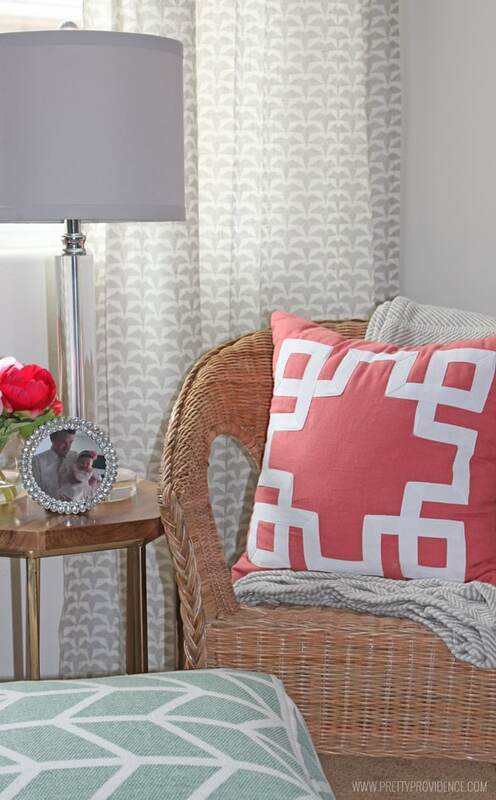 Drapery Panels – Again, Target for the win! I heart Nate Berkus, too. Plus we should mention what a great job Kels did with patterns as well. This is an area of design where I struggle. I know what I like and I can tell someone what my style is, but even though I love mixing patterns and textures and metals in a space, actually doing it doesn’t come naturally to me. Even with all the linens layed out on the bed in front of me I was like… “hmmm.” But boy does it work. Throw Pillow, Throw Blanket, Ceramic Bird, Wooden Vase, Green Pouf, Polka Dot Pillow, Wooden Blocks, Silver Arrow Stand, White Candle Holders, Flowers for the Vase – All Target finds! A couple of them were on clearance at my store, too! Always check the clearance first ppl. The flowers were actually a seasonal item (an Easter garland) and we just hacked it up to stick in the vase! 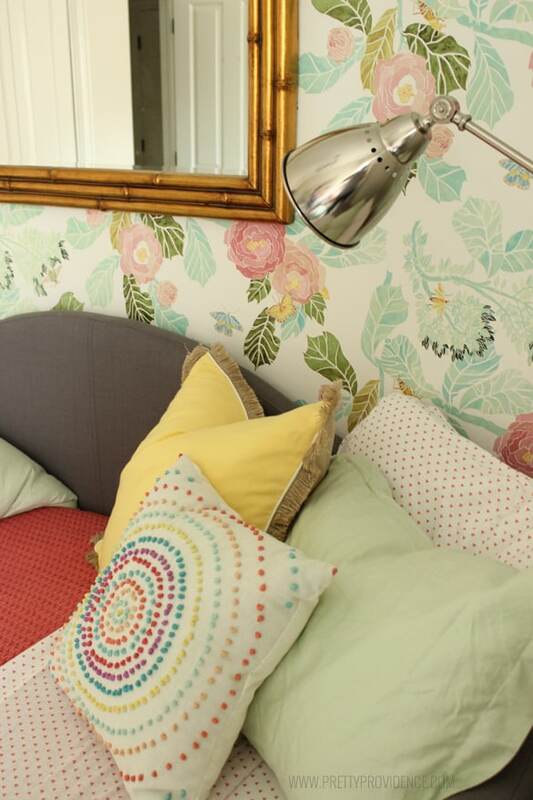 They turned out to be one of my favorite accents to the room, so bright and cheerful. 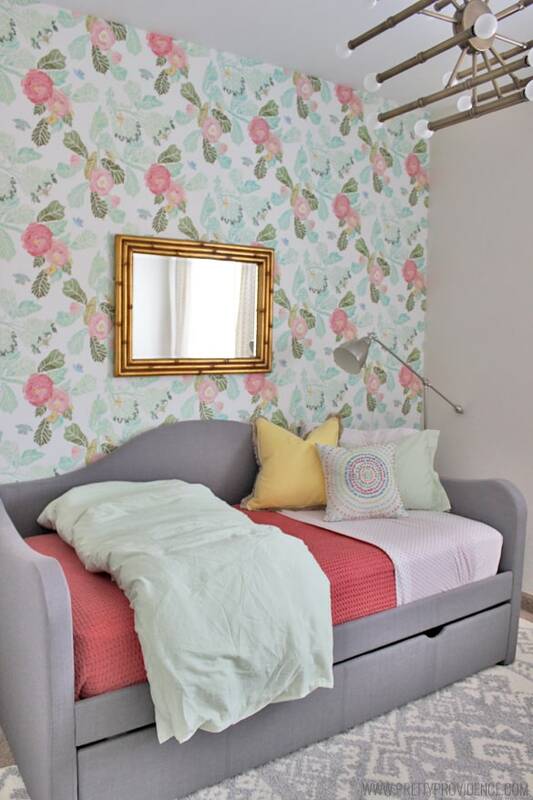 Coral Bedspread, Mint Duvet Cover (if you are looking for a different color, these are the exact same ones only cheaper), Actual Duvet, Sheet Set, Mattress – Super happy with the quality on all of these! Gold Bamboo Mirror – No longer in stock :( . This one has a similar vibe, unfortunately not a similar price tag.. yikes! 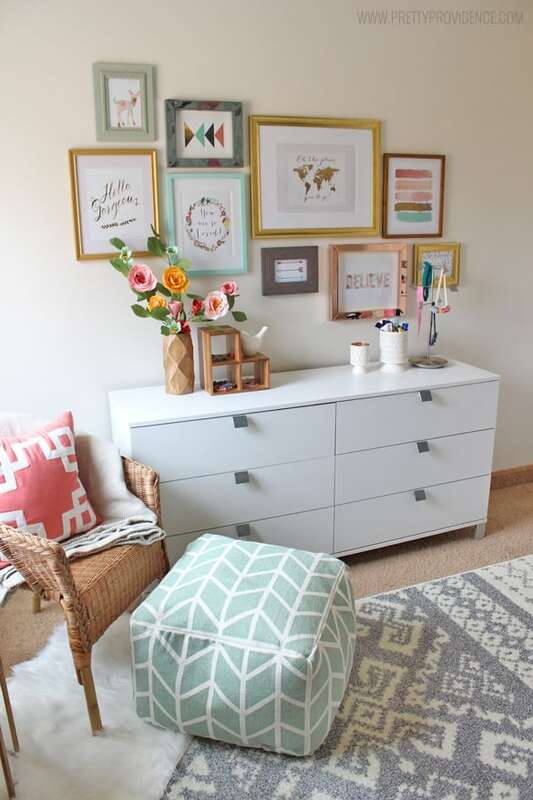 All the frames were purchased from various TJMaxx and Homegoods locations, all on clearance, as well as the wool rug under the chair and the big yellow accent pillow on the bed! You just can’t beat Homegoods when it comes to frames and they typically have an abundant clearance frame section, I think the most we paid was $12 for the big gold one! 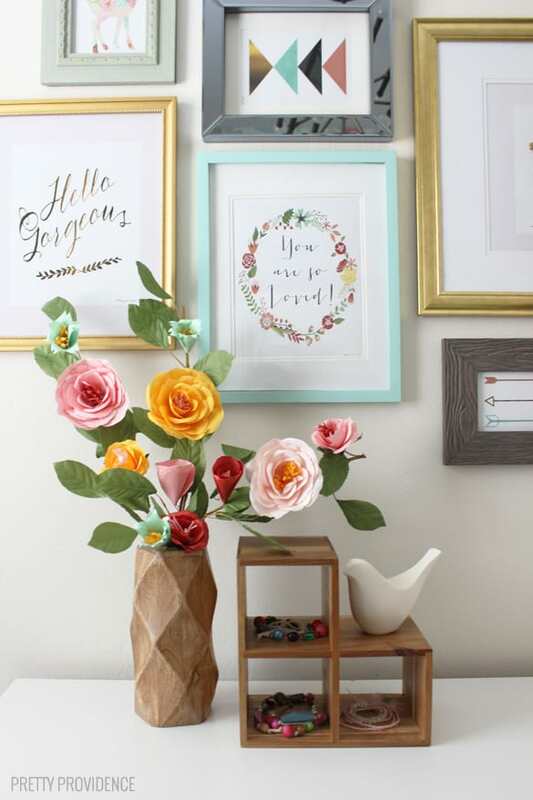 The Crystal lamp, circle frame on the side table and sweet floral arrangement were also TJMAxx finds! We bought all the artwork for the gallery wall from Penny Jane Designs shop. Typically art is something that Kelsey or I would design ourselves, but we were at a time crunch at this point, and we fell in love with these prints so we just went for it. I didn’t put pricing next to links because the prices on all these deal sites keep changing! Some things cost more than when I bought them and some cost less, so I just thought I’d leave the links and you could check for yourself if you are interested! To finish things up, how about a few more vignettes of the room? 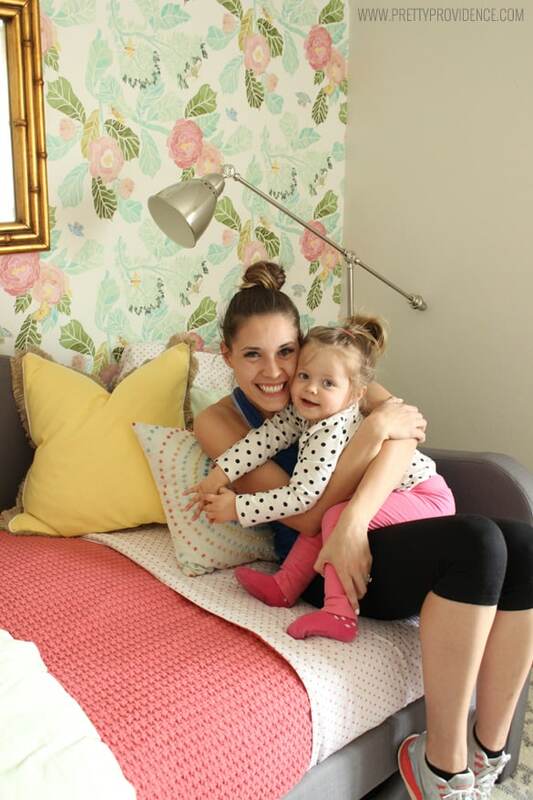 I think it only appropriate to finish off with a picture of Kelsey from The Wells Collection, who was the mastermind behind it all, and my little princess Nora, who was the inspiration for the room and its sweet recipient! Aren’t they adorable?? I love those two beauties so much! Whew! It feels good to finally have shared this with you all, I hope you love it as much as we do! 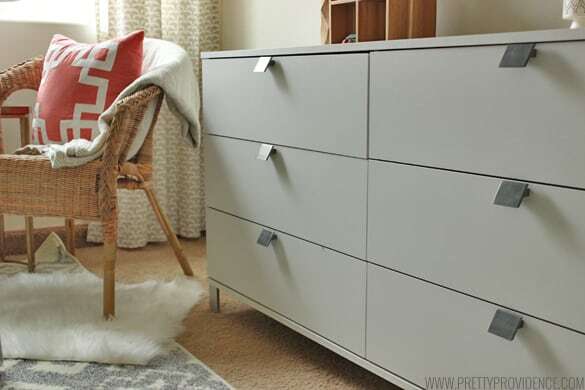 If you liked this post you will love our awesome Ikea Hack Desk or our DIY Sliding Barn Door Tutorial! « Happy Weekend: Links to Love! 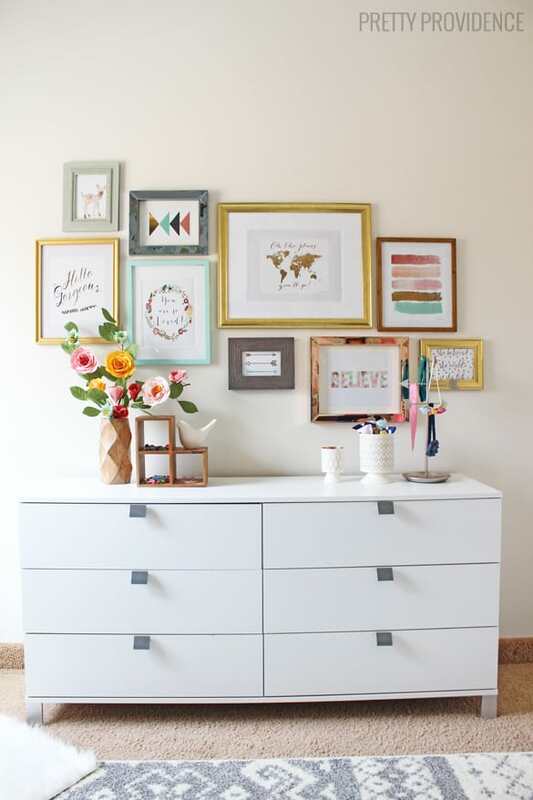 I love this gallery wall! Can you tell me what the sizes are on these prints? love this, do you know what the bed was called or the brand? the link no longer works. Ah shoot I don’t!! It was one of those deal sites and I am not seeing a brand listed on it anywhere ????. I’m so sorry! thank you for checking! i love it. Of course! Good luck! I actually recently saw a similar one at Costco! I’m in love with this room and slightly obsessed. 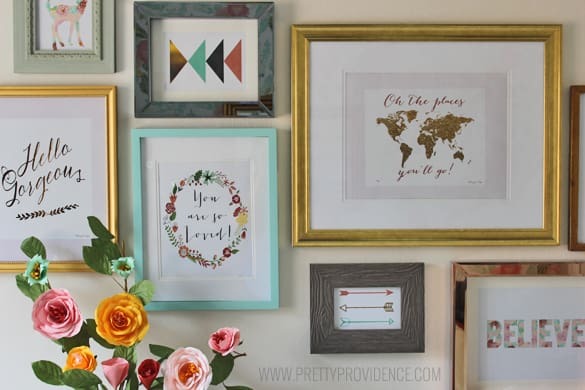 Your prints on gallery wall, are they all 8×10 with exception of a couple. oh you are so nice! thank you so much!! they are actually mostly 5’7 prints, but the frame sizes vary! I love how the room turned out!!! We just did my 10 year old daughter’s room and are getting ready to do the gallery wall. I love PennyJane designs! I have a few prints picked out from the etsy shop. I was just curious if you went with 8×10 prints and then framed them in various size frames. What size frame is the map picture. I like the idea of having one large frame and building around that. I’m just not sure about sizing. We are working with a dresser size similar to your dresser. So adorable!! I love that wallpaper and the gallery wall. Thank you so much! ???? I think the lighting fixture on the ceiling is such a great piece! My daughters room is in the daylight basement…so her drop ceilings are lower than most rooms. My guess is that this hangs down quite a bit? I am looking for something similar that isn’t so big..but still eclectic and cool like this one. We put ours on the shortest rung because my husband is super tall and I’d guess it hangs about a foot and a half! And yes, it makes SUCH a difference, the room wouldn’t be the same without it! Good luck with your daughters room! 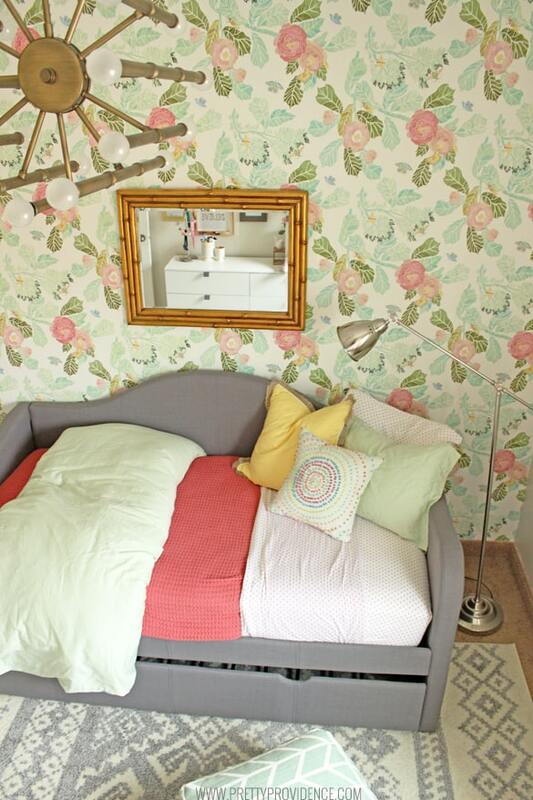 I really LOVE the wallpaper choice too. How many rolls did you end up buying? I bought two, I needed both for sure, but had some left over. The calculator on their website worked for me! I adore this room!!! The daybed is perfect for what I need– Is there a way to get around the $200 shipping charge from deal-hour.com that you know of? Ah! When I bought it they were having a free shipping over $75, so I didn’t even think about that! I have no idea.. I would maybe try to google it and see if you can find a coupon if you can’t wait for a sale! SO in love with this room! Inspired to do the same look for my 9yo who needs an updated room that will grow with her. I am going to be painting the walls….could you share with me the color of the painted wall. Is it a basic cream or beige? Aww you are so so sweet! The color is Natural Choice by Sherwin Williams! Best of luck, she is going to love it!! That bed is great! Curious as to your thoughts on quality and their super expensive shipping/policy that you have to help unload… how was your experience with the company? I can’t get enough of this room!! You and Kelsey did such a great job! I especially love the wall above the dresser. Perfect! One of my favorite posts! It is so nice to have a plan and save up so that your house looks like you decorated it on purpose and not just one whim at a time. 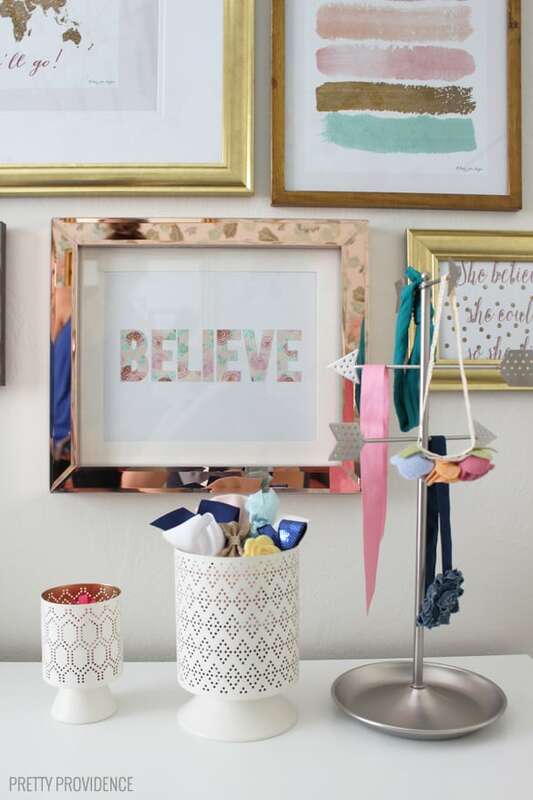 I love that you can save up and still have an organized beautiful space that feels so good to be in. Great eye and design skills @thewellscollection!! Love it! So beautiful! I love how it all turned out. It looks amazing! I’ll have to keep this for when I have kids so I can do some similar things. This room is absolutely gorgeous!! You have one lucky lil lady! 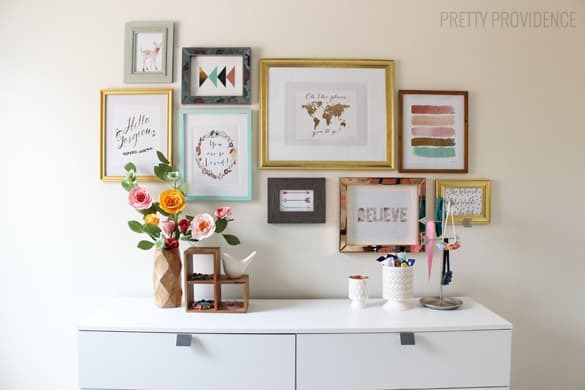 I love the gallery wall….great choices in frames and prints!